Ryan stops mid sentence as his eye's had fully adjusted and he was trying to figure out why there's was a large cat in front of him, he took a split second to try to figure it out. To himself * Ok he has a collar, so he is a pet, his color pattern suggests arctic enviroment. Spots? No rosetts, so he is a leopard...snow leopard? Ok so for some reason there is a snow leopard in a small town out nowhere near any snow area's, little wierd. I'm not sure why but i only noticed this detail now. The town is actually located somewhere it snows but also has hot summer days. It is also Spring time at the moment so most of the snow is melted but in the mountain area there is still some patches of snow left. Lux and Nox are ready to be found by someone. One of the two groups will find them once their done talking. Actually I think Joe, kallie, and Tesla should find you since they are walking around in the Jungle. Pm or ask them to find your characters. Hello everyone. New player here wondering if there were any spots left open. I'm new to the site, not to roleplay. Ah then welcome, and that would be decided by Musclecar, when he responds. I think i said something about this on the previous page. 2 other people asked the same thing and i will be adding some more people once the day is over in Exotic acres. The characters are still meeting each other so once that stuff is over than some spots will open. Also, I am waiting on someone to post like Brent, Marine Fox, Moon Howler, Leafolawl, or Seth. To keep this thing going so as to reduce the time till more spots open. Oh well im just waiting for the others to post. so since he musclecar just posted, you're waiting on juts me. gotta tell me these things. I'll try to come up with a post tonight some time. I didn't get anything I can work with from Seth and I don't thing Moon Howler noticed that I've placed TK where she can be seen. Species: Canis Lupus arctos...Arctic wolf. Personality: Van is an older wolf (going by canine years here) who enjoys walking through nature. He is a solemn creature with a respect for the beauty of the natural world. Van is philosophical and enjoys long talks with Gustave, his human. Appearance: Van possesses a 'salt-and-pepper' kind of coat, it being primarily white and flecked with grey and black. It changes with the seasons, growing thicker and lighter in the fall/winter and thinning out and growing darker in the spring/summer. He has dulled gold eyes. History: Van was born in the wild but was separated from his pack during an exodus. He was taken in by a hunter named Gustave Delirio and raised as a hunting dog, though his wolf heritage was never forgotten. Van spent twelve years in Gustave's care (up until today), and together they decided to move into Exotic Acres in order to meet more of his kind...hopefully. -Vanator enjoys spending his time outdoors in the company of a good book. -He prefers to walk rather than run. -Van and Gustave will live on the border of the forest sector on the outer edges of the neighborhood. Here's his speech color. I will use the standard italics for thought and I'll include quotation marks for speech. Everything he says or thinks will be in color. Last edited by Malkus on Wed May 30, 2012 5:05 pm, edited 3 times in total. It looks good but remember i cant add you to the list or let you post in the RP forum of EA until the spots open soon. I have been thinking of this for awhile but here he finally is. A character that anyone can use for a post or two if they want to. Personality: A wise old eagle that is very descriptive and all-knowing. Always tells the truth, and has great advise and knowledge for anyone who wants to learn from him. Appearance: Normal Bald Eagle look with some gray feathers on his head. -Lives in a large nest behind Snowy and Speedy's house. Last edited by musclecar326 on Thu Mar 08, 2012 5:35 pm, edited 1 time in total. Sounds like I'll have someone to debate philosophy with. Then his name on the other side. Ryan has a discoloration in one eye but the his left is a brownish green and the other is a dull neon green (This doesnt affect his ability to see)On his right leg on the upper thigh is a tattoo that reads USSR.E 789, sometimes this blends in with his fur but for the most part it does stick out. Personality: Ryan is very non talkative,and will try to avoid humans if possible. Ryan has also been said to be very cold to people, but sometimes on a good day he'll have a good time but he'll also sometimes sit and think to himself, if he meet's people who seem friendly enough and he feel's friendly to them he will be kind to them and defend them if they ever need him, but for people who get under his skin he will try to avoid them and if they persist he'll result to violence. Other: Ryan was part of the experimental Russian Red Fox domestication experiments and he went through many experiment's and chemical change's One day after another set of excrutiating tests one of the scientists thought they had killed Ryan in one of the experiment's, they were mistaken and when they were about to dispose of him he made his escape, in which he was found and rescued by an american tourist who adopted him and took him back to the states. Ryan has been known very occasionally to rant sometimes about the Russian facilty. Ryan has lost alot of his memory as a result of the experiment's and sometimes someone or something can trigger a little memory he has had, this will sometimes sadden him but most of the time he will spend sometime with that person or object and treat the object or person with special care and hospitality. Ryan does remember alot of military training and information he studied while in the facility. Ryan keeps an a Russian gas mask with him at all times, sort of like a momento, something he "stole" from the russians. I just went over this, and it seems that he has a total of 43 points instead of 42. I got wondering about his perception skill and had to check, and it looked like his stats were a bit high to me, so I counted them. I suggest taking it from the "Luck" pool since he ran straight into a low branch. Might I ask if there is a spot available for a wolf like me? "The formula is: 10.5 dog years per human year for the first 2 years, then 4 dog years per human year for each year after." That's the formula that I'm using. I plug ten human years into it and I get 53 human years. Read above i just answered Malkus about the same thing. I'm going to go with Moon Howler's scale for dog to human years. Finally to Marine fox's character. I noticed when i checked again that his special adds up to 45 not 43 or 42 so that needs to be changed soon. is there a free slot? EDIT - *facepawlms* OK so I'll be waiting till a slot is free. Thank you. So 1 human year = 3.5 dog years? Anyway, I'll adjust the app accordingly. I'm pretty sure all the role playing adventures here use the lifespan conversion from the comic. Rick's stated on multiple occasions that pets in this universe live about twice as long as in ours. Actually, one human year is 3.5 pet years for Pet Friendly Diss. For smaller animals like mice and hamsters a human year is 7 pet years. Alright so does everyone understand what Dissension and 44R0NM10 were discussing? because that is what I am going with for this RP. Also I will announce when more spots open later. If you want me to PM you when that happens tell me via PM. Is it ok if I go ahead and post my charrie for the next day? I believe he means character. You could now or wait till the slots open. unless, as GM, you've chosen to ignore this, you need to take 6 points away from Mr. Eagle. Personality: Marro is creative, kind, and caring, the kind of wolf who puts others before himself. He is enjoys friendly conversation of almost any topic, and is a bit of a romantic. Bio: Marro was found in the woods as a pup by a fortune teller named Luna Woods and raised by her ever since. She had taught him the art of mytsicism a couple weeks after she met him and he took to it well, and quickly surpassed her in the skill. Marro tends to have visions of the past or future that happend or revolved around specific items, however he can't do this whenever he wants, it either has be something important or certain requirements must be met, other than that mysticism extends to fortune telling, such as with tea leaves, palm readings, tarot readings and the like. Marro is almost always reading some type of book, horror novels, romance, art books, even mangas from time to time. And even though it isn't important, his favorite food is a cup of chicken ramen. 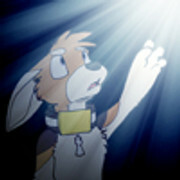 Last edited by WolvenPaw15 on Wed May 09, 2012 12:48 am, edited 4 times in total. Appearance: Van possesses a 'salt-and-pepper' kind of coat, it being primarily white and flecked with grey and black. It changes with the seasons, growing thicker and lighter in the fall/winter and thinning out and growing darker in the spring/summer. He has dulled gold eyes. He doesn't wear a collar, instead he has an earring shaped like a winged wolf. I've edited my app to the point that I think that it's worth resubmitting. So here it is. Leafolawl: i know Tesla talks really quiet and stuff but when the text is as small as this, or smaller "Hello How are you?" can you please put what it says in an OOC comment below it? thank you.